The Warrant of St. Patrick's Lodge No. 77, Newry was granted on the 27th December 1737. St. Patrick's Lodge No. 77 still meets in Newry, and enjoys the proud distinction of being "The Premier Lodge of Ulster." Warrant No. 77 issued to William Ponder, James Hollyman and John Ard to form `St. Patrick's Lodge' in NEWRY, Co. Down on the 27th December 1737. Volume 1 of the extant Grand Lodge Registers shows 61 brethren registered between 1757 and 1813. "5 March, 1807. “Grand Lodge read memorial from John Clark, Daniel Furley and Matt Griffiths of Lodge 521, Newry for the revival of Wt. 77 to be held in Newry - deferred". "2 April, 1807 – Read a Memorial from Brs. Jno. Clarke, Don. Turley and M. Griffith, praying the revival of Lodge No. 77 in Newry. Granted." Belfast News Letter - 7th July 1812. The Masters, Wardens and Brethren of Lodges Nos. 18, 23, 69, 77, 524 [error for 521] 706 and 914 return their sincere Thanks to the Rev. Chas. Campbell, for his appropriate and impressive Sermon, preached before them in Newry Church, on the 24th June, the Festival of St. John. The Brethren then present sincerely regret that even a more extensive audience did not witness his animated and pathetic recommendation of general Harmony, Loyalty and Patriotism. They also beg leave to return their Thanks to Lt. Col. Allen, of the Middlesex Militia, for his ready and polite acquiescence in granting them the use of the Regimental Band for that day. & The Ulster Recorder - 30th June 1814. We, the undersigned Masters of the Masonic Lodges of Newry, by desire of the Wardens and Brethren of said Lodges, return our sincere thanks to our worthy Brother, the Rev. William Maxwell, for the eloquent and impressive Sermon, preached to us on the 24th instant, St. John's Day - We also beg leave to return thanks to the Rev. Charles Campbell, for his compliance with our request, in giving the use of his Church on that day; and also to Captain Denison, of the North York Regiment, for his polite acquiescence in granting us the use of the Band. John McCourt; Master of the Wellington Lodge, No. 914. Newry Telegraph - 20th December 1851. Having seen an advertisement in your paper yesterday, intimating that the Brethren of St. Patrick's Masonic Lodge No. 77, will dine in Dransfierld's Hotel, allow me so much space in your valuable journal as to say, for the information of Brethren at a distance, that I recently visited that respectable Lodge, and it afforded me much pleasure to see one of the oldest Masonic Lodges in the North regaining its former position. Newry Telegraph - 14th August 1852. The Members of Masonic Lodge No. 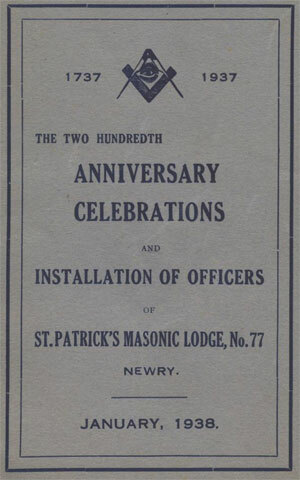 77, Newry, met yesterday in Dransfield's Hotel, and presented Wm. William Murray, their late W.M., previous to his departure for Scotland, with a handsome gold Albert chain, as a slight token to their esteem, and their appreciation of the very valuable services which he had rendered to Masonry in Newry, and especially in connection with No. 77 Lodge." Newry Telegraph - 28th October 1852. By the subjoined letter it will be seen that the Hon. Member for Armagh takes a zealous interest in the realisation of the project of erecting a Masonic Hall in that City, and attests the ardour of his devotion to the cause by a liberal subscription. The Hon. Gentleman is not one of those members who would merge local in compliment to imperial interests, but would uphold both. It is most creditable to him, and augurs favourably for his protracted Parliamentary connection with Armagh, that he is most anxious to identify himself, in every practicable way, with the interests of that city, and desirous, through honourable service, to cultivate the good opinion, and merit the approbation of his constitutes of all classes and creeds. The Armagh Brethren are men of the true stamp, who only conceive a project to execute it. Already they have received very liberal promises of support from several of the most influential members of the aristocracy. While on this subject, we may state that the Brethren in connection with Masonic Lodges Nos. 23 and 77, in Newry, are most anxious to assist in raising subscriptions in support of the project in question. The members of the latter Lodge have resolved that a subscription list be opened for that purpose, and the Worshipful Master and several influential members of the former have also promised to use their best exertions to forward the views of their Brethren in Armagh. The Armagh Brethren are in high spirits, and anticipate ere long having a temple, in which the solemn rites of the time-honoured Craft will have worthy celebration. The following is the letter from Mr. Ross S. Moore, P.M.
"Dublin, 5 Mountjoy Square South. It affords me sincere pleasure to contribute to the erection of a Masonic Hall in Armagh. You will, therefore be pleased to put down my name for ten pounds. Malcolm McN. Johnston, Esq., Armagh."" Newry Telegraph - 16th September 1854. "Presented by the Members of St. Patrick's Masonic Lodge, 77, to Brother Joseph Bell, as a token of respect for the very efficient manner in which he has conducted that Lodge, while Master. Newry, August, 1854." Lodge 77 is one of the oldest in the vicinity, and never, we believe, was it in a more prosperous state than at present. This fact speaks well for the efficiency of all the Officers who are distinguished for their courtesy and kindness of disposition to each other. Such acts of fraternal Brotherhood, as that we have now recorded, are the distinguishing characteristics of the Order. A deputation from Lodge 77, consisting of Bros. Bell and Sullivan, requested that the Brethren of their Lodge be admitted as Tenants at £8 per annum, the terms offered, but that they would wishes the figures "23", placed outside the Hall, be taken down prior to closing the agreement. This the Brethren acceded to, which has been recorded accordingly." Newry Telegraph - 11th March 1863. "Marriage of the Prince of Wales - Rejoicing in Newry. In front of the Masonic Hall, a large and very appropriate transparency was erected, on which were the words "Albert Edward, and Alexandra" - Hail, Star of Denmark"; also the Prince of Wales feathers. the harp, and several Masonic insignia. The members of the two Lodges - Nos. 23 and 77, assembled in the evening for supper, in honor of the Royal Marriage. The interior of the building was more to be admired than the exterior, the Lodge-room, and Supper-room being decorated with evergreens and flowers, and the whole hung with mottoes. Opposite the door, on entering the Lodge-room, were the words "Welcome, Sweet Princess, Welcome, and may choicest blessings flow on thee from Heaven, is the hope of 23, and the heartfelt prayer of 77". On the left of the door was a harp, formed of laurel leaves, and at other parts of the room were the monograms and portraits of the Prince and Princess. The decorations in both rooms displayed considerable taste. Newry Telegraph - 9th February 1867. As the time has now arrived when, in course of order, it becomes your duty to resign into other hands the high position which you have for a considerable time occupied in connection with Lodge 77, its Officers and Members feeling that you have been not only everything that could be wished for in a W.M., but also an ornament to the Ancient and Honourable Fraternity of Freemasons, take this opportune moment of thanking you, with all sincerity, for the manner in which you have been enabled to guide and instruct the Lodge committed to your care in the principles of Masonry, and of every moral and social virtue, and they beg that you will kindly accept the accompanying gift of a Past Master's Jewel, with which they wish to present you, not with the idea that your services can be sufficiently acknowledged by a trifling gift of his character, but with the hope that it will be a remembrance of the appreciation with which your Lodge looks upon your conduct while occupying the chair, and also that the moral symbolically taught by this jewel may be, as it has hitherto been, the rule and guide of your actions, and, that in the future, as in the past, you may still continue to be a most useful and zealous Member of the Lodge with which you stand connected. Your Brethren congratulate themselves upon the fact that, although they may not enjoy your high abilities in the position in which you have so lately displayed your talents and zeal, that they are not about to lose you in other most important spheres in connection with the Lodge to which you belong, and they hope that, at some future time, they will again enjoy, as they have done for the past eighteen months, your services as Worshipful Master of Lodge 77. Signed on behalf of the Members, Joseph Bell". "The Regular Meeting of the P.G.L. of Down was held in the Assembly Rooms, Savings Bank, Newry.... the first business to be transacted was the Installation as Provincial Grand Master of Lord Arthur William Hill...."
"The D.G.M., the P.G.M., and the P.P.G.M., and Officers of the P.G.L. were afterwards entertained to a sumptuous Luncheon by the Brethren of Lodges 18, 23, and 77, in the Victoria Hotel, Hill St."
"The Quarterly Communication of the P.G.L. of Down was held in the Masonic Hall, Downshire Road, Newry...."
"...W. Bro. Robt. McCalmont P.G.D.C. then marshalled the Brethren in the following Order of Procession.....Bro. John McCombe, W.M. of St. Patrick's Lodge No. 77, being the oldest Lodge in the Province, its Warrant having been connected with Newry since the 27th Dec. 1737 - carrying the Book of Constitutions...."
Newry Telegraph - 26th June 1873. The members of Lodge 77 commemorated St. John's Day by an excursion to Ravensdale Park, the beautiful seat of Lord Clermont. Having dined together they proceeded to Greenore, and from thence to Carlingford, where photographs of the party were taken in the ancient Castle of King John. After enjoying the splendid scenery of Carlingford Lough, the party repaired homewards. On arriving in town they adjourned to the Assembly Room, Savings Bank, where supper was laid out. Br. Joseph Bell, P.M., occupied the Chair. Suitable and loyal toasts and songs were given and duly acknowledged after which the members separated, having spent a very enjoyable day and evening together." "1 November, 1875 – Read a Letter from Lodge 77 Newry requesting information as to the Affiliation of a Brother holding the situation of Butler, but who does not wear livery. The Board consider that as the Brother in question does not wear Livery he is NOT excluded." Newry Telegraph - 29th March 1884. The Brethren of the Masonic Lodges, which occupy the Hall in Hill Street, have just gone to considerable expense in refitting and decorating the premises. It is some time since the place was papered and painted, and it was felt that improvement was needed. A Committee was accordingly appointed, the members of which secured the services of Mr. J. Thompson, Sugar Island and Mr. S. Fleming, North Street, to do the necessary work. The result has been that the Newry Lodges have now as comfortable and befitting a place of assembly as could be wished. The hall-way and staircase have been laid down with oilcloth from bottom to top, and the walls have been painted a delicate blue colour, with dado border. With the large room itself, as is natural to suppose, the greatest pains have been taken, and though it is not large, it is very nicely fitted up. The ceiling has been painted in panels, and the walls have been hung with Masonic paper, and further ornamented with a becoming dado and border. The handsome Grecian canopy over the Master's Chair has been stained in imitation of Sienna and white marble, picked out with gold. Right over the Master's table is a lamp beautifully ornamented with Masonic devices, such as the All-Seeing Eye. The Compass and Square etc. Beneath the lantern is the line in old English lettering in gold, red and white, "Gloria deo in Excelsis in Terra pax; in Domines Benevolentia." Two new grates of an aesthetic design have been put in, and the floor is comfortably carpeted. The room is lighted by several new gas brackets, the globes of which are of ground glass, with Masonic emblems thereon. The customary equipment of the room have been renewed, and altogether the greatest care has been taken to make the place thoroughly suited for the purposes for which it is intended. The ante-room has also been re-painted. On the floor above is the refreshment room, which has also been re-decorated in harmony with the style of the chief apartment. Those who had charge of the arrangements and those who, under their directors, carried out the work may be well pleased with the result of their labours." Second Series of the Grand Lodge Register shows 253 brethren registered between 1757 and 6th September 1859. Series three Vol. 6 of the extant Grand Lodge Register commence with only one brother a James Briggs shown as registered prior to 1st November 1860 then a line across the page and registrations then commence with Joseph Carlisle registered 7th August 1860. "3 October, 1887 – Read applications from Lodges 18, 23. And 77 Newry for leave to hold their Meetings in future in the new Masonic Hall, Downshire Road, Newry, which had been approved of by the Dept. Prov. Gd. Master of Down. Permission granted." St. Patrick's Lodge No. 77 had already held its first meeting in the new Hall on the 3rd October 1887. On St' John's Day in Winter 1887 the Lodge held a special meeting to celebrate the third Jubilee of the Lodge and Brother Dr. F.C. Crossle was installed as Worshipful Master. A total of 327 brethren registered up to 1st October 1900. In most cased the dates when the degrees were conferred and the issue of certificates is shown. Belfast News Letter - 22nd March 1902. On the invitation of the Worshipful Master and brethren of St. Patrick's Masonic Lodge (No. 77), a large number of the Craft and their lady friends attended at the Hall, Downshire Road, on last Wednesday evening. At half-past eight, when the party was seated in the lodge room, the usual Masonic Royal salute was given by the brethren, who were clothed according to their rank. Mrs W.T. Wheelan, Miss C. Murray, Miss Orson, Miss M. Cleland, Miss Tyrell, Mr. E.C. Sloane, Mr. J.P. Bell, and Mr. Sinclair, Lisburn. Tea and confectionery were then dispensed, after which Mr. Wm. R. Bell, who occupied the chair, invited all present to adjourned to the ball-room, where dancing was engaged in until midnight. The guests again proceeded to the lodge-room, where refreshments were served. Miss Orson sang "The Soldiers of the King," and was warmly applauded. Dancing was then continued until 2.30, when the singing of Auld Lang Syne and God Save the King concluded a most enjoyable and successful conversazione. Mr. S.J. Murray acted as master of ceremonies, and was ably assisted by the officers of the Lodge." "The Orangemen and Lodge No. 77"
In the good old days of Masonic Processions, the members of St. Patrick's Lodge, No. 77, Newry, organised an expedition for St. John's Day, to meet their Masonic Brethren from Loughbrickland and Banbridge; and, in order to lend dignity and importance to the proceedings, they borrowed a drum from an Orange Lodge in Newry. Seeing, however, that they mustered amongst them many good Catholics, through deference to the feelings of these Brethren, the side of the drum on which was painted the portrait of William of Glorious, Pious and Immortal Memory, was carefully turned down. Off they started, and all went well until they reached the Tinker Hill, where they encountered a party of Orangemen, who had heard of the insult thus offered to their revered Patron. The Masons were furiously attacked, deprived of their music, and forced to beat an ignominious retreat to Newry. Belfast News Letter - 24th June 1905. The party returned to Newry by the train which left Drogheda at 6.40 p.m., and all seemed thoroughly pleased with the day's outing." St. Patrick's Lodge No. 77 was represented at the Memorial Service, conducted on the 10th October 1910 by the Lord Primate in memory of Dr. F.C. Crossle. Twenty-three members of St. Patrick's Lodge No. 77 served in the 1914 -18 War and Bro. W. Crozier made the supreme sacrifice. Series four Vol. 12 of the extant Grand Lodge Registers shows a long list of brethren clearly transcribed, including their occupations, from the previous volume with a total of 255 brethren registered up to 4th February 1924. In most cases the dates when the issue of certificates is shown, together with the occupation of the brother. Series five Vol. 17 shown as Vol. 1 of the extant Grand Lodge Register commences with the registration of William Davis, Station Master, registered 4th August 1924. A total of 146 brethren registered up to 7th April 1952. In most cases the dates when the issue of certificates is shown, together with the occupation of the brother. Series six Vol. 21 of the extant Grand Lodge Register commences with the registration of James A. Skillen, Farmer, registered 2nd March 1953. A total of 102 brethren registered up to 5th September 1983. In most cases the dates when the issue of certificates is shown, together with the occupation of the brother. From 1984 the registration of members of ST. PATRICK'S LODGE NO. 77 is held, in alphabetical order, in a computerised register by Grand Lodge, Freemasons’ Hall, 17 Molesworth Street, Dublin 2. The Registration of the Worshipful Master, Wardens and Secretary of Lodges are held in separate Registers, the first Volume covering the period 1983 to 1994 inclusive and the second Volume covering from 1995 to date.